India - considered as one of the world's fastest growing smartphone markets - had a new entrant recently - the US based mobile company, InFocus and ever since, it has been making the right noises. In order to bolster its presence in the highly competitive mid-range segment, the company entered into a partnership with the Taiwanese contract manufacturer for electronics - Foxconn - and launched its newest smartphone, Infocus Turbo 5 on 28th June, 2017. 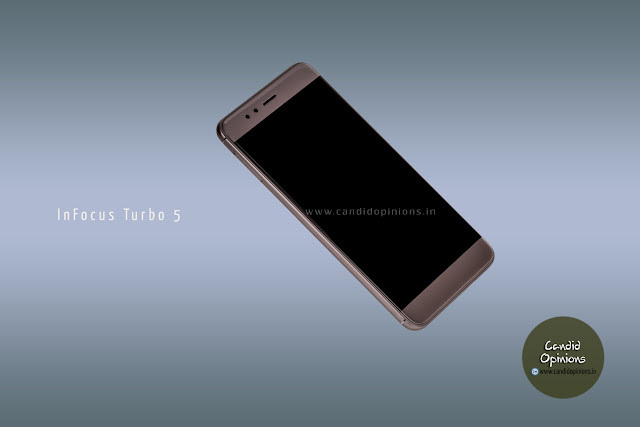 Boasting of several high-end features but coming at a very affordable price, the Infocus Turbo 5 has already caught the attention of the Indian mobile users. 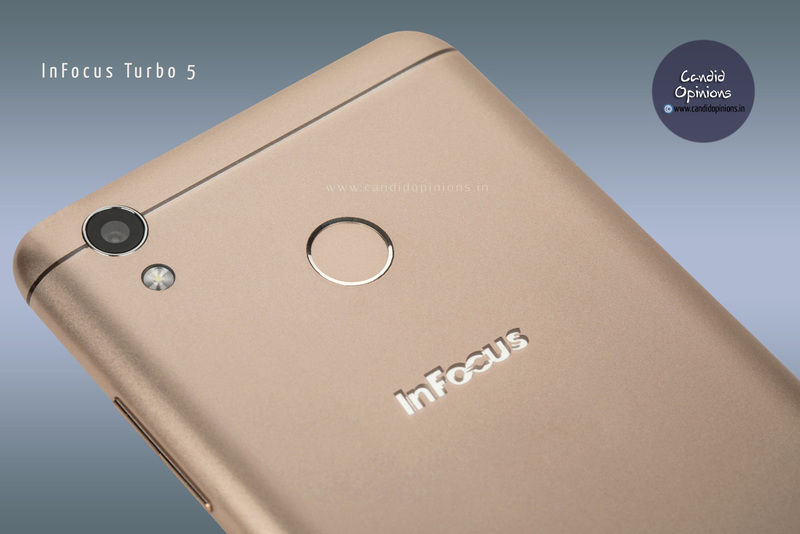 The new smartphone - Infocus Turbo 5 - is exclusively available on Amazon India since its first sale on 4th July, 2017. Available in two classy colours - Mocha Gold and Pure Gold, the smartphone comes at two different prices based on their storage capacity: one variant is priced at Rs 6,999 that has got 2GB RAM and 16 GB internal memory whereas the other variant of Infocus Turbo 5 is priced at Rs 7,999. This second variant has got RAM of 3GB and internal memory of 32 GB. 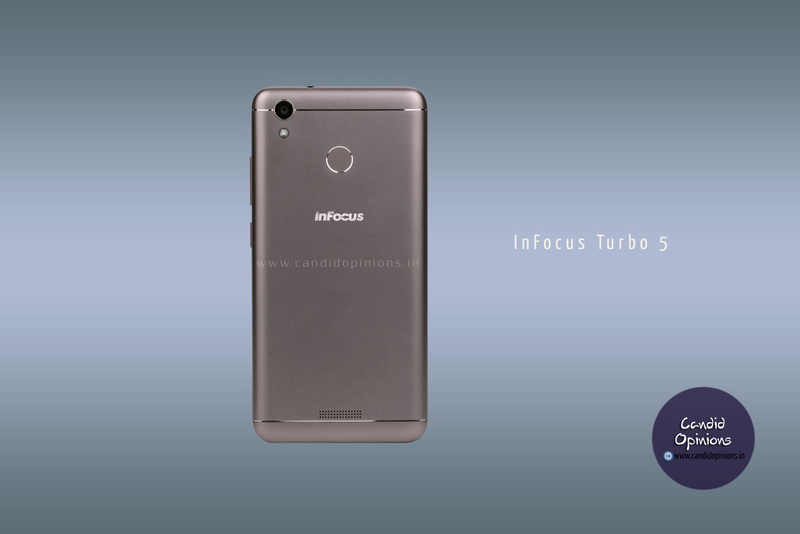 Speaking of its specifications, the new InFocus Turbo 5 has got a 5.2-inch HD display with a 720x1280 pixels resolution. The top display is protected by 2.5D curved glass. The smartphone is powered by quad-core MediaTek MT6737 processor with a clock speed of 1.3GHz. It also has a Mali T720 MP1 GPU. Apart from its all-metal design, it has also got a fingerprint scanner at the back, which would unlock the handset in 0.5 seconds, the company assures. As far as the cameras are concerned, the InFocus Turbo 5 sports a 13-megapixel rear camera that also has got a LED flash. Apart from that, the smartphone also features a 5-megapixel selfie camera on the front side. Both the cameras have an aperture of f/2.2. Now speaking about the connectivity provisions, the options in InFocus Turbo 5 include 4G VoLTE support, Wi-Fi, Bluetooth, GPS as well as FM radio. But for me and many other prospective buyers, the most impressive thing about this budget phone is the strong battery life that it promises - 5000mAh that allows up to 34 days of standby time, almost 50 hours of non-stop music playback and so also 23 hours of video calling time. 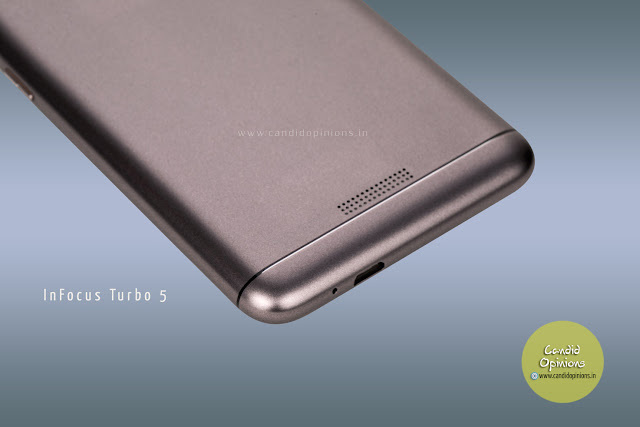 Thus no matter how long a smartphone user browses the net or plays games or watches movies or listens to music on InFocus Turbo 5, he or she now need not have to worry about charging the phone again and again. Not just that, this value-for-money smartphone also boasts of reverse charging feature. Thus the users would be able to turn the phone into a power bank. So those of you who are looking to buy a smartphone that would last an entire day should consider buying this new smartphone - InFocus Turbo 5. This smartphone is an absolute value-for-money phone.